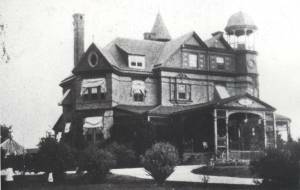 "Arlington," Sandy Run’s original clubhouse, was the residence of Irene duPont Hendrickson Ralph. Demolished in 1954, the house was situated in an area where the club’s main practice green is located today. The new club was chartered in June 1923, under the name of the Edge Hill Golf Club. Signing the certificate of incorporation were Leonard W. Brown, A. J. Murdoch, Harry F. Beck, F. E. Taylor, J. Russell Breitinger, Parke Weikert, A.R. McConnell, Norman V. Holmes, W.H. Calverley, and W. Nelson Mayhew. Edge Hill subsequently acquired a part of the former I. D. H. Ralph estate, 115 acres "situate near Camp Hill Station, Montgomery County, Pennsylvania, at the southeast corner of Valley Green and Walnut Roads." The club paid exactly $1,000 per acre for this parcel. In order to consummate the deal, meet the mortgage payments, and make the necessary improvements (golf course and clubhouse), the members each subscribed to a $500 bond. They had a choice of the Cash Payment Plan (hand over the $500 in one lump sum); the Yearly Payment Plan (five installments of $100 each, the first payment to be made on March 15,1924, the four remaining installments due Oct. 15 in 1924-27); or the Monthly Payment Plan. A member had to have a pretty good head for figures in order to keep the Monthly Payment Plan straight: $35 on March 15, 1924; $15 on April 15, 1924; $10 on the 15th of May, June, July, August, and September.